Our team at Dr. Friedman, DDS will tell you that your mouth is a complicated place on a microbiological level. Harmful bacteria form dental plaques which convert the sugars in food to acids that wear away at tooth enamel. Meanwhile, saliva washes away some of the detrimental acids, while minerals work to rebuild where teeth are damaged. The foods you eat are important for managing this balancing act between harmful bacteria and helpful rebuilding agents. Eating well is an essential part of keeping your teeth healthy. 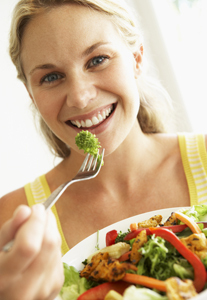 Consult Dr. Philip Friedman about your diet for tips on food habits that keep your teeth strong and cavity-free. For more information about the link between your diet and your oral health, or to schedule an appointment with Dr. Philip Friedman, please give us a call at our convenient Savannah, GA office!